As 110kg mountain biker who likes descending I'm rather particular about how my brakes feel and operate. Brake maintenance is something I do on a regular basis and earlier this year I performed my first DIY brake bleed see the story. When researching kits for my first bleed Epic Bleed Solutions featured highly but on that occasion I chose a different path. Having now used both the official Avid kit and the Epic kit it's my opinion that the Epic kit is every bit as good with some notable advantages, not the least of which is price! 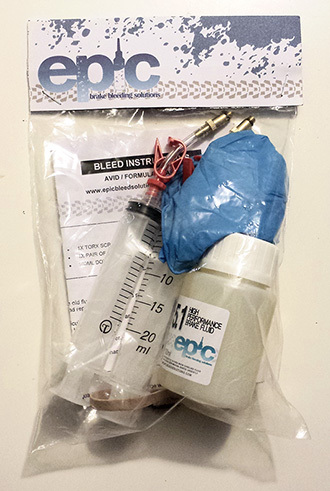 "We felt we got a better degassing result with the Epic Bleed Kit"
I'm not a militant anti-packaging type but I know many people are so it's worth highlighting that the Epic guys have left out all the unnecessary folded cardboard and use simple low waste packaging. The Epic Avid Bleed Kit comes with two 20ml syringes, filler tubes with hose clamps and their own bespoke bleed adaptors that are guaranteed to fit all Avid brakes (including Elixir, Code and Juicy) as well as Formula brakes. Our kit came with 100ml of DOT 5.1 brake fluid which should be enough for around 3-4 bleeds and importantly it was sealed to avoid any leaking during delivery. It also included a Torx bit for removing the bleed port screw, a rubber band, Nitrile (Latex free) gloves (an important inclusion) and easy to follow instructions. We had a great experience with the Epic Bleed Kit. The syringes were of excellent quality and even though we gave them solid pulls during the DOT fluid degassing we didn't have any air leaks nor did the plunger seal let go. We're not sure if it was the quality of the DOT fluid or the syringes, but we felt we got a better degassing result with the Epic Bleed Kit and it was achieved more quickly. As mentioned in our previous blog opening and closing the hose clamps is worth practicing prior to filling with DOT fluid. We found the hose clamps easy to use with one hand, a huge advantage if you are performing the bleed on your own. Our only complaint was the size of the grip on the bleed adaptors we found them a little small for stubby gloved fingers. While the price of the Epic kit might appear to be its greatest selling point it was the added extras like Nitrile (Latex free) gloves and the rubber band that had us smiling, especially when we realised we'd forgotten to get these things out of the shed. The little inclusions within the Epic kit made the process so simple. Their product is clearly designed by guys who use it. Big kudos for the little things. The only additional items you'll need are a bleed block and alcohol wipe (for removing any drips of DOT fluid). Conveniently Epic have a DIY Bleed Block & Spacer Kit for only £4.99 (AUD $8.50) and a range of spares and accessories at equally low prices including a Hydraulic Hose Cutter £5.99 (AUD $10) for shorting your brake line. Check out their website http://www.epicbleedsolutions.com for the full range. The Avid Bleed Kit & DOT 5.1 Fluid pack that we tested retails for £14.99, + £3.99 worldwide shipping bringing that to around AUD $32 delivered. Without the DOT Fluid will save you £2. Also check out their website for videos and tips on brake bleeding.